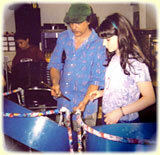 A group with little or no musical experience can learn a steel drum piece in a one hour session. Parts are learned through visual and aural techniques rather than musical notation. Participants develop skills in listening, teamwork, discipline and respect. The group will experience the joy and satisfaction of performing together after just one workshop. Do not be surprised if your group wants to start their own steel band! Presentations explore the history of pan and its relationship to the culture and carnival of Trinidad & Tobago, the pan's country of origin. Demonstrations of historical variations of pan and modern pans along with audio and visual media give students an integrated learning experience focused on the birth and growth of this new musical instrument. Contact us at (603) 447-5107 or click to email us for more information, or to book a workshop.